Not sure if I was supposed to include 138 as well. [Edit:] So does this mean the station is now being destroyed by the torpedoes? Well done Arioch! I hope the station has adequate shields. Hopefully tactics do not involve using friendly defense stations as shields. Particularly if said stations do not survive said tactics. Let's hear it for cold reptilian pragmatism. I wonder if our space elves and Alex are hoping to get out of the Leido Crossroads with the help of a new vessel jumping in from Seren. Or perhaps they're just going to go cruising out of the system, putting space between themselves and any incoming enemies as they wait for a response fleet to jump in and secure the place, getting fished out of the void once things are safe. Now the question is how many of those 16 torpedo's which acquired target lock spent itself in that series of blasts. Alright, Talon's maneuver is sound, albeit quite reckless, threading a needle (flying between the station's hub and ring) at, I dunno, Mach-10 or something, but given the circumstances it's the only option available to her. What is wrong in my opinion, is that she didn't tell Cerulean about it, resulting in the station holding back on their point defense and taking 16+ torpedoes to the face, likely resulting in the station being destroyed or at least severely damaged (see the debris scattering in the last frame of Page 139). I'm curious about Talon's next move though. I think that in her place I'd cut all power and see about minimizing all possible emissions from the shuttle the moment I pass through the station's rings, and pretend to be a piece of debris hoping the Umiak don't notice me. 30 July 2018: Sorry for the delay! I have been extensively sidetracked. I will post the new page as soon as it is ready. 24 July 2018: ...or perhaps a bit later in the week. 23 July 2018: There will be a new page this week, but it will probably be posted sometime Tuesday. I also posted a new essay on the Barsam in the Insider section. And I hope the station survived. But I would've expected the station's anti-collision prevention systems to rip the shuttle apart. Can't imagine them being programmed so narrow to allow such high-energy elements to fly through its spoke. The only reason I can see, is that Cerulean (or someone from her staff) had the idea of what Talon is trying, and programmed the systems to let the shuttle pass. And now it's cruising, likely pretending to be (high-velocity) debris, until the Barsam can pick them up. How shuttle manage to pass through station force field? Looking at the image at the top of page 138, the gaps between the sections of station are pretty big - As big as the sections themselves. I'm looking through Insider now to see if we've ever had any firm information on how far from a ship's hull defensive screens extend. I think we can conclude from this "not far". @Krulle about collision prevention - indeed, unless they disabled it in preparation for a rough emergency landing. @Luge - They're (a) not "bubble shields" as seen in Star Trek and the like, more like "polarized hull plating" that "sticks to the hull" rather than extends above it and (b) IIRC these defensive screens protect against/absorb energy weapon impacts, but not kinetics or explosives. With that in mind, they should protect somewhat against antimatter or nuclear explosions as those when in space are mostly photons and particles but not hinder the shuttle from passing between the station's structure. The Loroi and Umiak use electromagnetic screens, capable to only stop energy weapons. Kinetic weapons and other collissions cannot be stopped by such screens. The best strategy now would be to shut down everything and just drift until picked up by Prophet's Reason. The explosion will have temporarily blinded Umiak's sensors and the drifting shuttle would look like a piece of debris from the destroyed station. It might just work. It didnt worked if she just missed the station so PD can shoot down some torpedoes, and then barrelrolled behinde it, right? I remembered that it was something like this but couldn't find any definitive clarification from Arioch. There's an Insider page on weapons which is very detailed, but not on screens. You can see the effect on the top panel on page 77 where a shield deflects the beam of either a heavy blaster or a pulse cannon. Its deflected literally just outside the hull of the Umiak vessel. Sorry, accidentally put in the 9 for September rather than the actual date. Should be fixed. 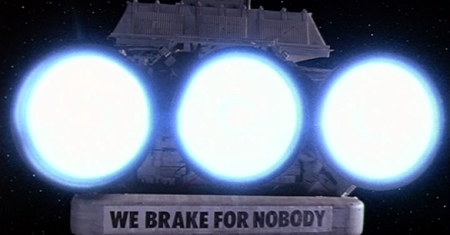 I'm not sure what sort of anti-collision systems such a station would have (tractor beams don't exist at this tech level), aside from point-defense weaponry, which was focused on the torpedoes which were already targeted at the station. Defensive screens are electromagnetic fields that sit close to the surface of the hull, and they have minimal effect on kinetic attacks or purely photonic attacks; they are designed for defense against charged particles (blasters and plasma weapons). The shuttle may have felt a jolt as they passed through, but it wouldn't stop them. "figures" - is it an idiom or just a short request for torpedo count? It's an English idiom, short for "That figures." It means, "That makes sense," or "That's what I expected." Thanks. I thought Loroi usually don't use idioms. It's not really an idiom. The meaning of "That figures" is quite literal. The Loroi aren't actually speaking English, they're speaking Trade; the English translations are technically coming from the narrator (Alex). I have deliberately added some variations in the way different characters' words are translated to help distinguish them, even when these characteristics have nothing to do with the original Trade speech (for example, Alex's words are translated with contractions but the speech of the Loroi isn't, to make the Loroi sound more formal, but in reality Alex isn't using contractions either, because Trade doesn't have contractions). Talon's original line in the script was "That was predictable," but I changed it to "Figures," because that is more brief and suits Talon's style of speaking. This nuance probably makes it more complicated when trying to translate again to a third language, but that's not really something I can afford to worry about. Writing well is hard enough when all one has to worry about is one's own language. Do you actually write the original script in a literal Trade translation? Bravo for such effort towards consistency. No, but the script draft often has simpler dialogue, which gets more crafted as I fit it to panels.